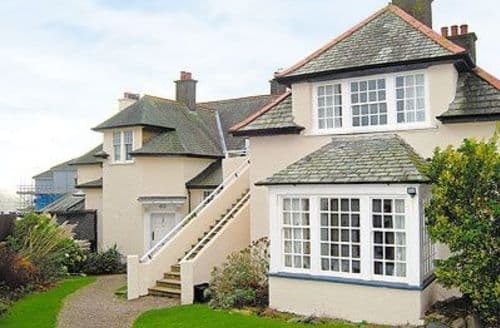 What our customers are saying about our Holiday Cottages In Seascale To Rent. "Being attached to a working farm offers other opportunities too - seeing horses and sheep being let out into the fields, getting insight into the life of a working farm. Everything has been thought of - the drawers are full of games, maps, leaflets about the area, and it’s altogether so inviting we are booking a return stay.A really good village shop sells everything. Good pubs with food. Very warm and comfortable cottage. Not much headroom in bedrooms. Otherwise really good.Lots of low level walks around here near blengdale forest for an energetic dog and family. There’s an orchard and Isobelle let my wife pick some fruit which made a terrific crumble. It is located at the end of the farm courtyard so very secure and isn’t overlooked. The cottage needs a little modernisation but this would make it more expensive I guess so all in all good value compared with others.Mrs Ostle was very helpful with the minor problems we did have with bedding and gas.Just spent 4 nights/5 days at S3621 with my husband, daughter and friends of ours – together with our 2 dogs. Lovely welcome from Isabelle (the farmer) who showed us around the property and informed us that she would be on hand next door should we require anything. Lovely 3 bedroom cottage with 2 bathrooms set on a working farm in a beautiful location. Although there were four adults, two teenagers and two dogs, the cottage never seemed overcrowded. The kitchen is fully equipped with all mod cons, including separate hob/oven, dishwasher, microwave and fridge freezer. Also in the downstairs shower room there was a washing machine/tumble dryer for the use of guests. The cottage also has sky television and access to free wifi. The farm is set in 250 acres+ of woodland with some beautiful walks and approx 10-15 minutes walk into the village of Gosforth for shops, pubs etc. A great location also for Wastwater Lake, Eskdale Valley and the coast. We were fortunate to be staying at the cottage during lambing season and were also delighted to see the arrival of the new foal which was born in the field adjacent to the patio area. Just before our arrival, the farm was also busy with the arrival of calves and a litter of puppies; which we could quite gladly have adopted and taken home! 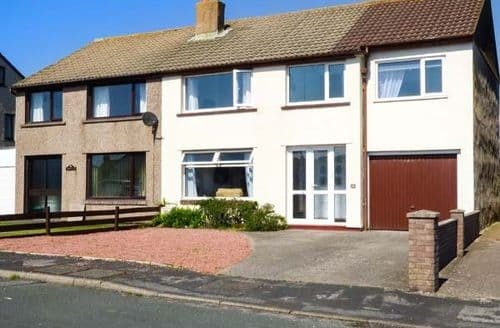 We found the cottage to be very comfortable and homely and situated in a beautiful location. We are already planning our next trip to this beautiful part of the Lake District and would recommend S3621 to family and friends." "A really good village shop sells everything. Good pubs with food. Very warm and comfortable cottage. Not much headroom in bedrooms. Otherwise really good.Lots of low level walks around here near blengdale forest for an energetic dog and family. There’s an orchard and Isobelle let my wife pick some fruit which made a terrific crumble. It is located at the end of the farm courtyard so very secure and isn’t overlooked. The cottage needs a little modernisation but this would make it more expensive I guess so all in all good value compared with others.Mrs Ostle was very helpful with the minor problems we did have with bedding and gas.Just spent 4 nights/5 days at S3621 with my husband, daughter and friends of ours – together with our 2 dogs. Lovely welcome from Isabelle (the farmer) who showed us around the property and informed us that she would be on hand next door should we require anything. Lovely 3 bedroom cottage with 2 bathrooms set on a working farm in a beautiful location. Although there were four adults, two teenagers and two dogs, the cottage never seemed overcrowded. The kitchen is fully equipped with all mod cons, including separate hob/oven, dishwasher, microwave and fridge freezer. Also in the downstairs shower room there was a washing machine/tumble dryer for the use of guests. The cottage also has sky television and access to free wifi. The farm is set in 250 acres+ of woodland with some beautiful walks and approx 10-15 minutes walk into the village of Gosforth for shops, pubs etc. A great location also for Wastwater Lake, Eskdale Valley and the coast. We were fortunate to be staying at the cottage during lambing season and were also delighted to see the arrival of the new foal which was born in the field adjacent to the patio area. Just before our arrival, the farm was also busy with the arrival of calves and a litter of puppies; which we could quite gladly have adopted and taken home! We found the cottage to be very comfortable and homely and situated in a beautiful location. We are already planning our next trip to this beautiful part of the Lake District and would recommend S3621 to family and friends." "Lots of low level walks around here near blengdale forest for an energetic dog and family. There’s an orchard and Isobelle let my wife pick some fruit which made a terrific crumble. It is located at the end of the farm courtyard so very secure and isn’t overlooked. The cottage needs a little modernisation but this would make it more expensive I guess so all in all good value compared with others.Mrs Ostle was very helpful with the minor problems we did have with bedding and gas.Just spent 4 nights/5 days at S3621 with my husband, daughter and friends of ours – together with our 2 dogs. Lovely welcome from Isabelle (the farmer) who showed us around the property and informed us that she would be on hand next door should we require anything. 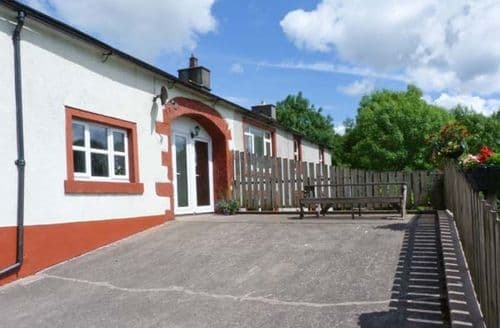 Lovely 3 bedroom cottage with 2 bathrooms set on a working farm in a beautiful location. Although there were four adults, two teenagers and two dogs, the cottage never seemed overcrowded. The kitchen is fully equipped with all mod cons, including separate hob/oven, dishwasher, microwave and fridge freezer. Also in the downstairs shower room there was a washing machine/tumble dryer for the use of guests. The cottage also has sky television and access to free wifi. The farm is set in 250 acres+ of woodland with some beautiful walks and approx 10-15 minutes walk into the village of Gosforth for shops, pubs etc. A great location also for Wastwater Lake, Eskdale Valley and the coast. We were fortunate to be staying at the cottage during lambing season and were also delighted to see the arrival of the new foal which was born in the field adjacent to the patio area. Just before our arrival, the farm was also busy with the arrival of calves and a litter of puppies; which we could quite gladly have adopted and taken home! 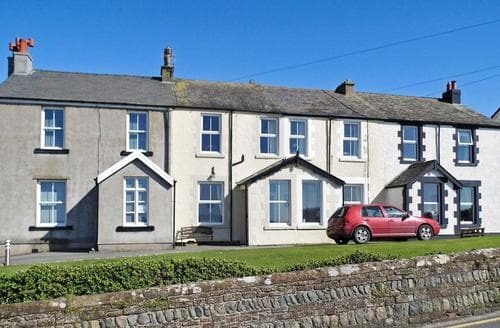 We found the cottage to be very comfortable and homely and situated in a beautiful location. We are already planning our next trip to this beautiful part of the Lake District and would recommend S3621 to family and friends." "Mrs Ostle was very helpful with the minor problems we did have with bedding and gas.Just spent 4 nights/5 days at S3621 with my husband, daughter and friends of ours – together with our 2 dogs. Lovely welcome from Isabelle (the farmer) who showed us around the property and informed us that she would be on hand next door should we require anything. Lovely 3 bedroom cottage with 2 bathrooms set on a working farm in a beautiful location. Although there were four adults, two teenagers and two dogs, the cottage never seemed overcrowded. The kitchen is fully equipped with all mod cons, including separate hob/oven, dishwasher, microwave and fridge freezer. Also in the downstairs shower room there was a washing machine/tumble dryer for the use of guests. The cottage also has sky television and access to free wifi. The farm is set in 250 acres+ of woodland with some beautiful walks and approx 10-15 minutes walk into the village of Gosforth for shops, pubs etc. A great location also for Wastwater Lake, Eskdale Valley and the coast. We were fortunate to be staying at the cottage during lambing season and were also delighted to see the arrival of the new foal which was born in the field adjacent to the patio area. Just before our arrival, the farm was also busy with the arrival of calves and a litter of puppies; which we could quite gladly have adopted and taken home! We found the cottage to be very comfortable and homely and situated in a beautiful location. We are already planning our next trip to this beautiful part of the Lake District and would recommend S3621 to family and friends." "Just spent 4 nights/5 days at S3621 with my husband, daughter and friends of ours – together with our 2 dogs. Lovely welcome from Isabelle (the farmer) who showed us around the property and informed us that she would be on hand next door should we require anything. 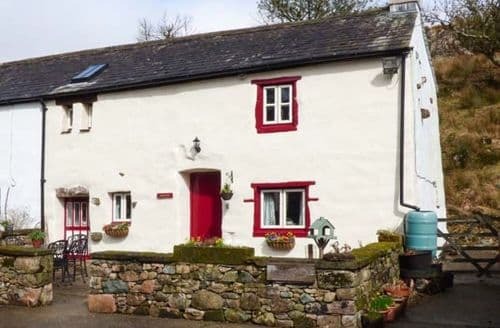 Lovely 3 bedroom cottage with 2 bathrooms set on a working farm in a beautiful location. Although there were four adults, two teenagers and two dogs, the cottage never seemed overcrowded. The kitchen is fully equipped with all mod cons, including separate hob/oven, dishwasher, microwave and fridge freezer. Also in the downstairs shower room there was a washing machine/tumble dryer for the use of guests. The cottage also has sky television and access to free wifi. The farm is set in 250 acres+ of woodland with some beautiful walks and approx 10-15 minutes walk into the village of Gosforth for shops, pubs etc. A great location also for Wastwater Lake, Eskdale Valley and the coast. We were fortunate to be staying at the cottage during lambing season and were also delighted to see the arrival of the new foal which was born in the field adjacent to the patio area. Just before our arrival, the farm was also busy with the arrival of calves and a litter of puppies; which we could quite gladly have adopted and taken home! We found the cottage to be very comfortable and homely and situated in a beautiful location. We are already planning our next trip to this beautiful part of the Lake District and would recommend S3621 to family and friends."